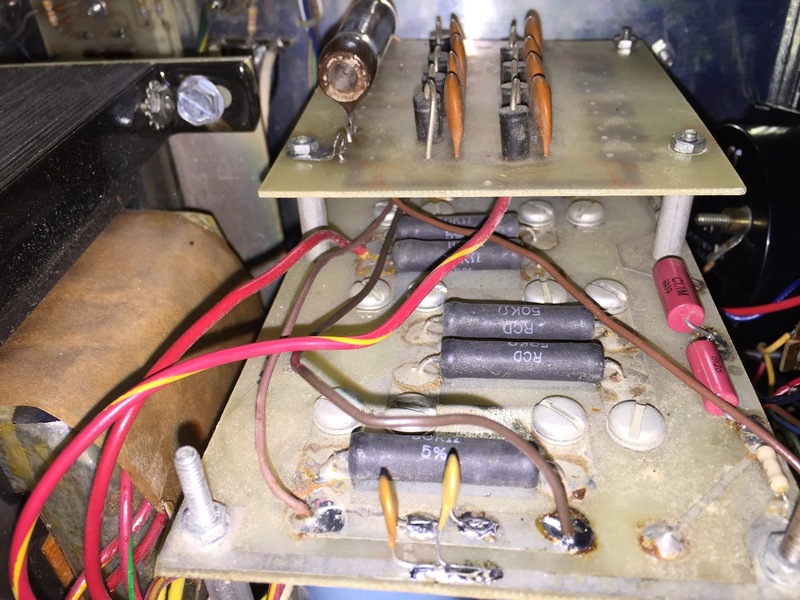 Fixing the Ameritron AL-80A. Again. If you remember from last August, I repaired my AL-80A. Well, that fix lasted little more than a month before I once again had an arc while tuning and it started acting weird. Grid meter would drift up when the amp was keyed, and would pin hard against the right stop when RF was applied. Surprisingly, though, it was working -- only the metering seemed to be affected. Sadly, my lust for DX overcame my caution, and I occasionally used it even though the metering was weird. 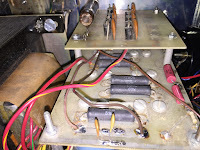 While the amplifier continued to work as designed, the grid current meter pounded so heavily against the right stop that eventually the needle broke off. 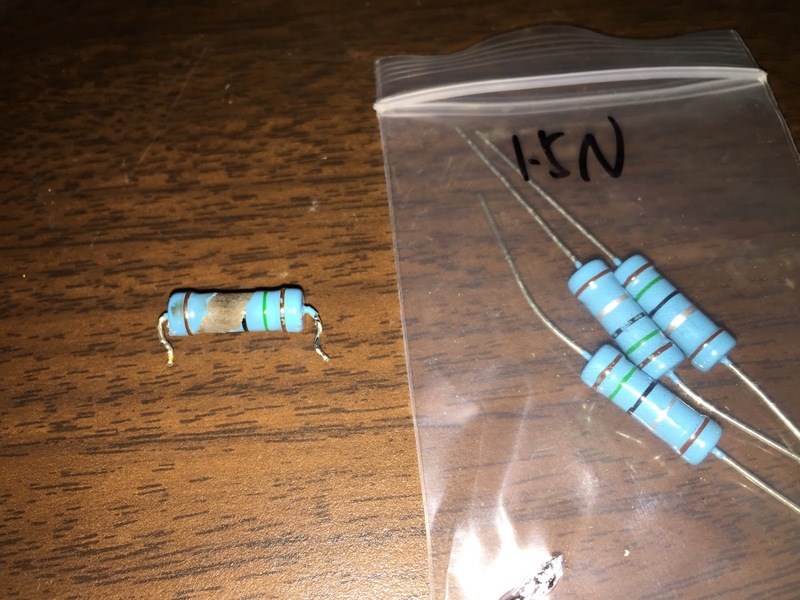 Blown 1.5 ohm 3 W resistor on left. I finally pulled the rig over to the workbench and took it apart. What I found wasn't pretty. 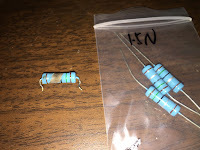 Yes, the same 1.5 ohm 3 watt resistor had disintegrated. The metal foil had been blasted away from the resistor form. It was completely open. It was no wonder that the grid meter acted so strange -- it had no shunt! I also found a article by Tom Rauch, W8JI on proper amplifier metering. It talked about a very simple circuit change that would likely prevent this sort of damage in the future. Indeed, after doing some research, I found that this protective circuit to be part of several Ameritron amplifiers, include the AL-811, AL-80B, AL-82 and AL-572. Unfortunately, it wasn't included in the AL-80A. Small caps added across the B- rail. Added ground lug visible on rectifier board. No matter, very simple to add. 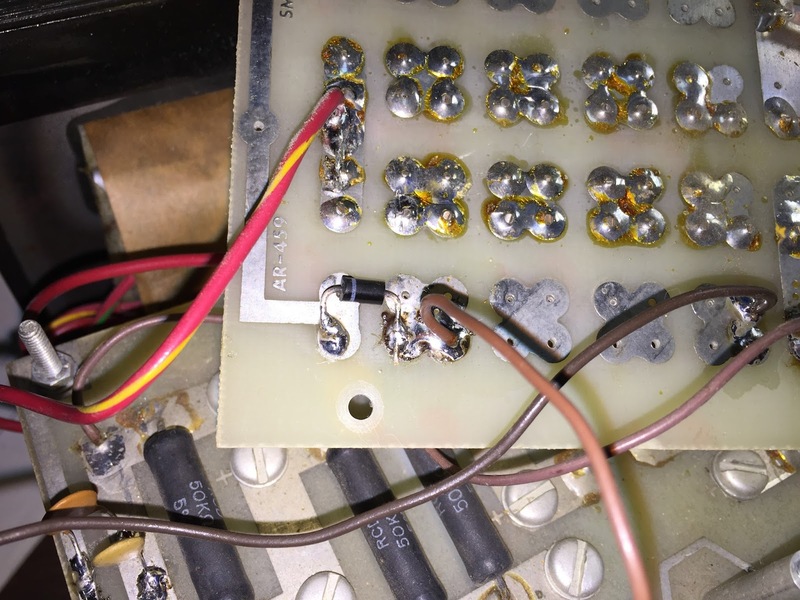 I placed two small capacitors on the B- rail to ground, right on the capacitor board. The glitch diode took a little more doing. I already had a glitch resistor mounted to the rectifier board, and it seemed logical to place the diode there. I added a ground lug to give me a good ground connection, and placed the diode underneath the board. Tom recommends a 1N540x diode, but I didn't happen to have any. I did have plenty of 1N4007 diodes -- which don't offer nearly as much protection. However, I figured that some protection was better than none at all. I still had the problem that the grid current meter had no needle. The broken needle was still in the meter face, so I used a tiny drop of superglue to re-bond it to the post. So far, it is holding, although I don't know how long that will last. 1N4007 on bottom of rectifier board. something I have since corrected. Buttoning it all up, I thought this would be an easy victory. Well, the multi-function meter seemed to be operating correctly now, but the grid meter behavior hadn't changed. It was still pinning with the least bit of RF. Something was still not right. It was a few days before I had a chance to pull the amp back to the workbench. Off came the thirteen screws holding the cover. Then the eight screws holding on the front panel, plus all the knobs and indicators. Pulled the meters, and then the meter board out where I could see it. Placing an ohmmeter across the grid current meter showed that the shunt wasn't in place, since it read about 450 ohms. The resistor itself was OK. Looking at the meter board, I found that there was a open in one of the traces. Apparently, the glitch was strong enough that part of the board acted like a fuse! A bit of solder and a piece of bare wire bridged this open. Buttoning it up again, it once again works as it should. Now I can enjoy chasing DX without the guilt. Indeed, I worked XR0YS on Easter Island just as soon as the amplifier was repaired.